£5K UP FOR GRABS EVERY SUNDAY! The Main Attraction JP game plays every Sunday at 9pm, where the prize gets higher the quicker you bingo! The minimum JP is £500, but bingo in less than 29 calls and the whole £5,000 prize pot will be yours! Cards are free if you’ve deposited in the last seven days! On the last Saturday of every month you could win a share of an incredible £10K to treat yourself to a little “something, something” that you deserve. Get tickets to the £10 000 Pay Day game in the pre-buy tab from the start of each month. It's time for the Big Bingo Event – The $50,000 Coverall minimum $10,000 Event this Saturday night, your chance to join the growing list of previous big winners and walk away with $50,000 in cash. Playing from 8pm EDT in the Bingo Tourney room, there are 50,000 great reasons to play. Celebrate the last weekend of September with the £500k Weekend! Players have a chance to win a portion of the £500,000 bingo prize pot from Friday 26th to Sunday 28th September. All you have to do is play your favourite bingo games over the three days and you can walk away with massive money prizes! Half of the prize money, £100k Friday, £100k Saturday and £50k Sunday, will be waiting for you in the Gold Rush room, so take a look at the schedule and join these brilliant bingo games to enjoy even bigger wins this weekend! There’s fun and excitement to be had every day in the CyberBingo Classic Room with the Crazy Pots Sessions. Playing daily at 1pm, 8am, 10am, 12pm and 2pm EDT, these crazy bingo games can award anything between $5 and $100! SPECIAL PROMOTION on all Classic Bingo Games. For every 6 bingo cards you buy they'll give you 3 free! There is a huge £20k prize pot up for grabs and just one hour for you to win it in! You can bag £10,000 across ten bingo games in the Gold Rush room between 10pm and 11pm on Saturday 4th October. That’s £1,000 to be won per game! The other half of this great cash prize can be claimed in the £10k Bingo Linx, held at 10.30pm, also in the Gold Rush room. This great game features an amazing £8,000 jackpot with £2,000 in X to Go! Tempted to stay in? Well, Saturday Night in and Win is back in the Sapphire Room. If you win a Full House on this special Saturday Night in and Win game you'll win £/€500. The game times are 9pm, 10pm and 11pm. There's a new star in town this month with the Elvis Lives $5,000 Fullhouse minimum $500 game at 5pm EDT on Saturday October 11th. Enjoy some Rock 'n' Roll Bingo fun with the King of Bingo and you could be winning yourself a cool $5,000 in cash in the Candy Frenzy Bingo 90 Room. Will you be the Jackpot Hero? Play on site for your chance to be the £500 Jackpot Hero and trigger a Jackpot Ball full of cash to share with other members! They are inviting all Pinkies to come and play in the£100 Bingo Competition! How to join in the fun? ... and they’ll reward you with 1 point for every £1 wagered on the leader board. 1st & 2nd Places win £50 each. The top 2 players that go on to accumulate the most points within the competition period will each bag a £50 prize! $20,000 Up for Grabs this weekend! Join them Friday and Saturday for your chance to win over $20,000! The action starts at 10 PM every day in the $20,000 Weekend Special Room. Enjoy the Halloween Bingo Promotions this weekend. €150k Bingo Sidegame Prize Draw! Join them in the Bingo client for a sidegames extravaganza, where there will be €150,000 up for grabs now through Sunday 9 November! For every €12 cash you play on any of the qualifying bingo sidegames, you'll earn 1 free enter into the prize draw. Wager the most in a day during the Super Slots Tourneys to win 1st prize: $250, 2nd prize: $200, 3rd Prize: $150, 4th Prize: $100 and 11 consolation prizes of $50 each, every day on 123BingoOnline Slots. There's a delicious $1,000 in prizes up for grabs every week to tourney winners, all you have to do is play in the Bingolicious Tourney games and if you win the most games throughout the evening, you could win $300 cash! The tourney takes place Friday night from 8:00PM EST till 11:59PM EST. Win a 3 month supply of cheese! Can you snap a Feta photo than everyone else? Send them your cheesy grins for your chance to win a 3-months supply of cheese this Christmas! Enjoy a prize packed evening this Winners Night! On Sunday 16th November, the Gold Rush room will feature a £30,000 prize fund. All you have to do is play any of the Roll On, X to Go and Last Chance Saloon games from 6pm to midnight and you’ll enjoy bigger wins all evening! Black Friday is always filled with great offers from 8pm ET in the Bingo Tourney room on Friday November 28th for your chance to win an incredible $1,000 cash for free in the fun filled Black Friday Buy 3 Get 1 Free event. Pick a golden number for the weekend, then, if you win a full house on that number you will get a share of a sky high 250,000 points! Roll on the fun after the show and win a fabulous £5,000 – for just 10p a ticket! The exclusive partnership with The X Factor means that on Saturday 29th of November you have the chance to shine too! Enter The X Factor Bingo room at 10pm on Saturdays and buy tickets for 10p each. As well as one lucky winner being in for a big £5,000 treat, you can win £20 with one line and £50 with two lines! The Candy Frenzy Bingo 90 room is always filled with the very best in B90 bingo fun, low cost tickets and fantastic cash prizes to be won. Take part in the Thirty Five for Five games at 5pm ET on Friday December 5th for your chance to win $35 in prizes for just $0.05 a ticket and you could win a fantastic $100 Walmart Gift card for free! Simply enter the code CMX5 under My account > Bonus section to receive your FREE entry into our fantastic Thirty Five for Five prize draw to win a fabulous $100 Walmart Gift card in time for the Holidays. Join The Butler on Saturday night for The BIG £10,000 jackpot @ 10pm in the Friendship AND Harmony Rooms!! Buy 6 tickets and GET 6 tickets FREE!! Your share of an astounding 250,000 points is here. Just choose your golden number and win a full house, it’s really that simple! Show them your festive jumper and win up to £50! It's time to break out those Xmas sweaters. Send them a photo of you wearing your festive fabric for your chance to win a £50 cash prize! Stars will shine brighter than ever every Saturday this month at LBN. Yes, that’s because you are getting back free bingo tickets worth £10 for spending more than £25 on bingo. Besides, if you spend more than £50 on slots, you also get free bets worth £10. Simply deposit £10 on a Saturday. Be ready to shine with happiness every Sunday this month as your deposited amount turns into a shining Hot Ball for that day. Simply deposit between £10 and £25. Bingo on the number you’ve deposited and win £10 BBs. Join Marvin the monkey every Friday at 10pm for his £10k Free Bananas game, where there’s a big bunch of cash to be won… for free! This £10,000 cash jackpot gets shared between the FH, 2 line, 1 line, 1TG and 2TG bingoers for loads of chances to win! Let’s go bananas! Join them on Friday Night for your chance to win over $10,000.00 starting at 10PM in the Friday Night Room. 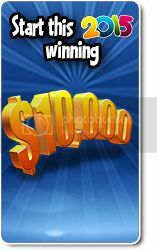 You´ll have the chance to win over $1,000 in GUARANTEED CASH prizes! Every Friday is Party night at Clucky Bingo. Special Party chat games between 8pm & 10pm! Loyalty points galore are up for grabs, so grab your glad rags and partaayyy! £150 Guaranteed Jackpot game coming your way every Friday @ 8pm! Only 50p per ticket, and you can prebuy in advance any time until the game starts. Good luck everyone! Join them this Friday Night for your chance to win over $10,000.00! The action starts at 10PM in the Friday Night Room. You are invited to the Pulse Party, and this is definitely one party you won’t want to miss! Join in the fun on desktop or app for the chance to win prizes up to £200 in every game from 8pm to 10pm on Friday. Start playing in any 90 or 75 ball bingo game as per normal between 11am Friday 23rd and midnight on Thursday 29th January 2015, and they’ll reward you with 1 point for every £1 wagered on the ‘Be Free’ leader board. For every £1 you wager, you will receive 1 point on the ‘Big Cash Bingo’ competition leaderboard! The top 5 players who accumulate the most points within the competition period will each bag a £10 prize!